The Unique Signed Sports Memorabilia Store: WIN SIGNED SPORTS MEMORABILIA! Test your Sporting Knowledge in our "Sports Memorabilia Autograph Challenge Quiz"
WIN SIGNED SPORTS MEMORABILIA! 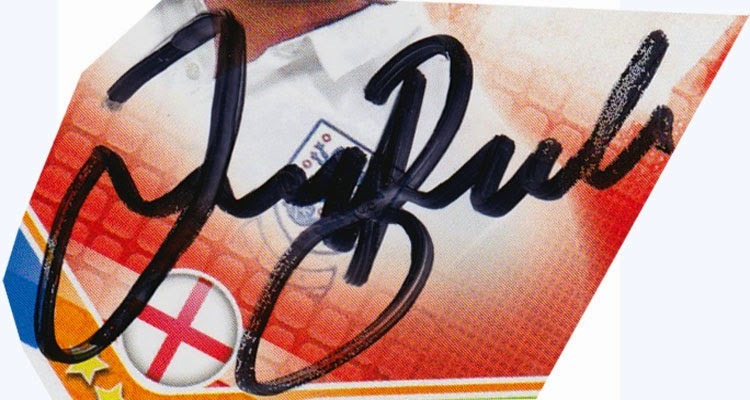 Test your Sporting Knowledge in our "Sports Memorabilia Autograph Challenge Quiz"
1. Look at the following five mystery sports autographs. 2. Identify each British sporting personality from their signature. via the Entry Form on our Official Entry Page. 4. The first correct entry picked out the cap at the end of September will win a Signed Photo & Autobiography of one of the truly Great British Sporting Legends of all-time - Ian Botham. The first four autographs have 'clues' in the image but the final Prize Autograph has no visual help! All signatures appear on the Uniquely Sporting website. Happy Autograph Hunting !! And remember to challenge your friends to take a SMACQ Down !! Entry Form for a chance to win Ian Botham Signed Sports Memorabilia.